The Mr. Jelly Belly "Bean Machine" Dispenser is the perfect way to store and share scrumptious Jelly Belly beans. Simply crank the Jelly Belly mascot positioned on the side of the unit to release a small helping of beans. The fully mechanical unit (meaning no batteries required) is see-through, allowing you to watch the Jelly Belly beans slide down a blue chute and past a series of large yellow gears. The Jelly Belly Dispenser is an officially licensed Jelly Belly product and comes packaged with a small sampling of Jelly Belly beans. Larger packs of beans can be purchased separately. Dimensions: 9.25" x 6" x 6"
Please note that the Jelly Belly Dispenser no longer features the small plastic cover where the beans are dispensed. The universe's best way to deliver Jelly Belly beans! There's just nothing quite like a Jelly Belly. 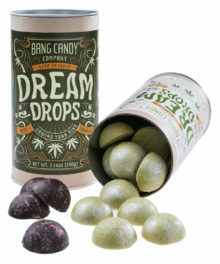 As candies go, it's one of our favorites. 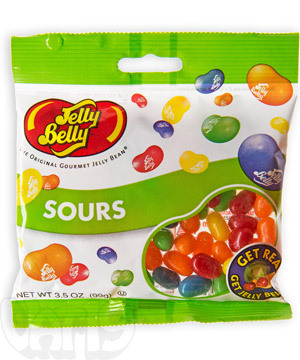 The chewy, sweet, and big flavor of a Jelly Belly is très awesome. And now you can flaunt your eternal love for Jelly Belly jelly beans with the mechanical Mr. Jelly Belly "Bean Machine" Dispenser. Simply crank Mr. Jelly Belly to send a small handful of beans sliding down a chute and into a small retrieval tray. Toss out that useless stapler! 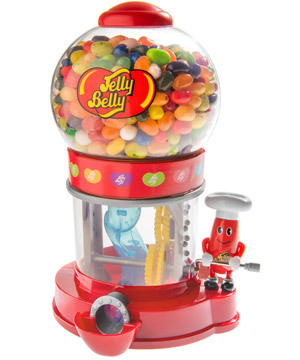 The Jelly Belly "Bean Machine" is the perfect mechanical device for any office. 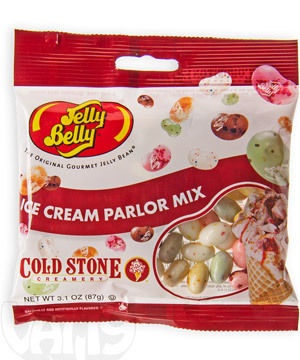 Check out our short demo video of the Jelly Belly "Bean Machine" below. Please note that the small plastic cover (located where the beans end up) is no longer included on the unit. This video was shot before Jelly Belly made this change. Warning: Watching this video will generate an uncontrollable desire to munch on some Jelly Belly beans! The Mr. Jelly Belly "Bean Machine" stores and dispenses 23 ounces of Jelly Belly beans. 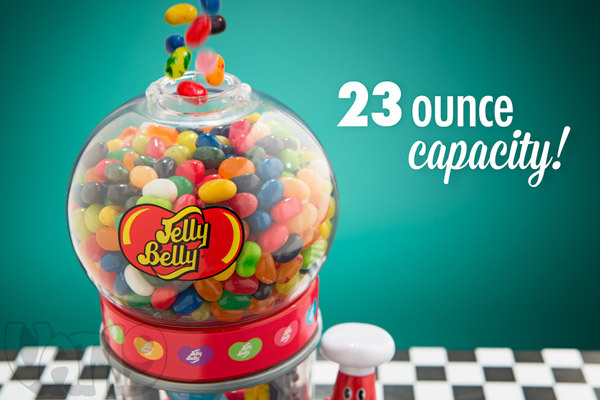 That means that your awesome Jelly Belly dispenser can hold approximately 570 jelly beans. Stupendous! The Jelly Belly Dispenser can hold approximately 570 delicious Jelly Belly beans. 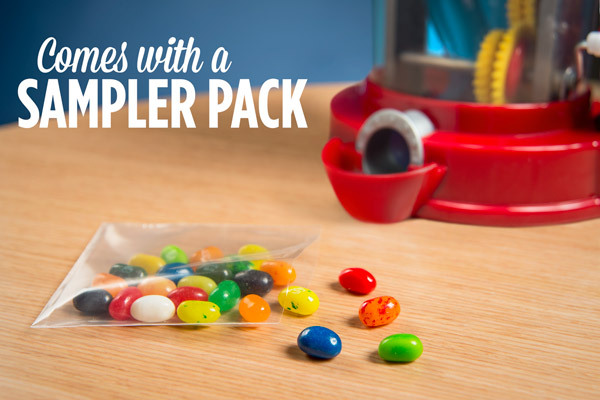 Each Jelly Belly Dispenser comes with a small one-ounce sampler pack. 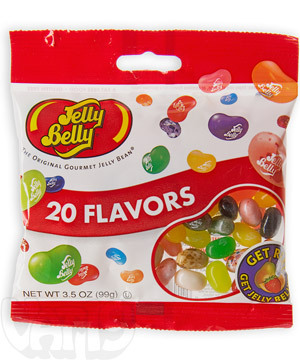 It includes approximately 20 Jelly Belly beans of assorted flavors. The Jelly Belly Dispenser comes with a small sampler pack of approximately 20 Jelly Belly beans. The Mr. Jelly Belly "Bean Machine" craves jelly beans! 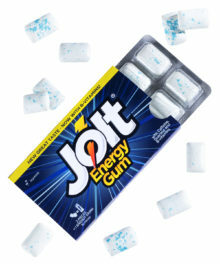 Fill up your dispenser with these popular 3.1-ounce or 3.5-ounce packs. Each pack contains roughly 85 jelly beans. 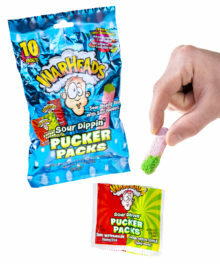 Choose from the following sets: 20 Flavors, Sours, Soda Pop Shoppe, and Ice Cream Parlor Mix. 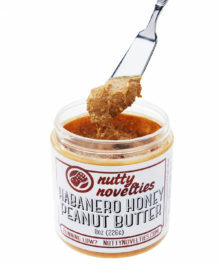 Note: To view flavor and ingredient details for each pack, please click here. Sugar, Corn Syrup, Modified Food Starch, Contains 2% or less of the following: Peach Puree Concentrate, Blueberry Puree, Lemon Puree, Orange Puree, Strawberry Puree, Watermelon Juice Concentrate, Apple Juice Concentrate, Cherry Juice Concentrate, Lime Juice Concentrate, Tangerine Juice Concentrate, Pear Juice Concentrate, Coconut, Sodium Citrate, Sodium Lactate, Citric Acid, Ascorbic Acid, Tapioca Dextrin, Natural and Artificial Flavors, Color Added, Red 40 Lake, Yellow 5 & 6, Blue 1 & 2 Lake, Yellow 5 & 6, Red 40, Blue 1, Beeswax, Carnauba Wax, Confectioner's Glaze, Salt. Sugar, Corn Syrup, Modified Food Starch, Contains 2% or less of the following: Apple Juice Concentrate, Grape Juice Concentrate, Lemon Puree, Cherry Juice Concentrate, Orange Puree, Citric Acid, Fumaric Acid, Sodium Citrate, Sodium Lactate, Natural and Artificial Flavors, Color Added, Red 40 Lake, Blue 1 & 2 Lake, Yellow 5 & 6 Lake, Beeswax, Carnauba Wax, Confectioner's Glaze. Sugar, Corn Syrup, Modified Food Starch, Contains 2% or less of the following: Strawberry Puree, Chocolate Liquor, Cocoa Butter, Soy Lecithin (an emulsifier), Cocoa Powder, Citric Acid, Ground Cinnamon, Tapioca Dextrin, Natural and Artificial Flavor, Color Added, Red 40 Lake, Yellow 5 & 6 Lake, Red 40, Blue 1 & 2 Lake, Beeswax, Carnauba Wax, Confectioner's Glaze, Salt. 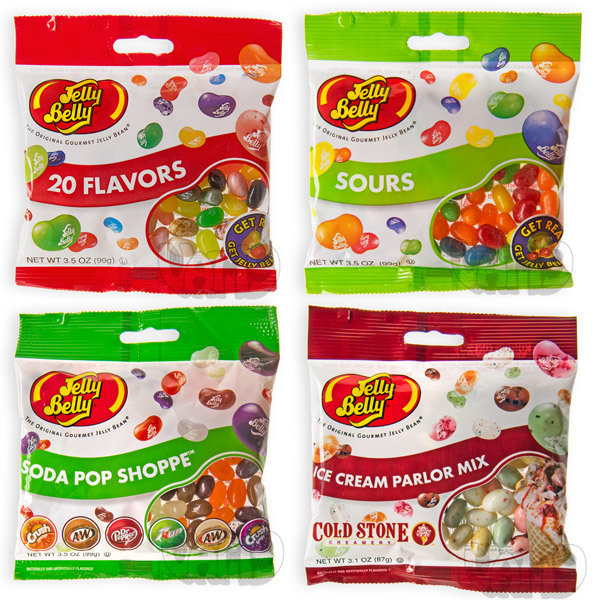 Choose from four Jelly Belly packs. Question: Does the Bean Machine require batteries? Answer: Nope! The Jelly Belly Dispenser is fully mechanical. Simply crank Mr. Jelly Belly to release 4-5 Jelly Belly beans from the top, down the blue tube, and into the tray. Question: How many Jelly Belly beans does it hold? 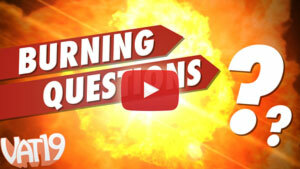 Answer: The dispenser can hold approximately 23 ounces of tasty Jelly Belly beans. This works out to approximately 570 beans. So, you'd need to purchase seven of our 3.5-ounce packs to completely fill the dispenser. Question: Can I dispense other candies with the Jelly Belly Dispenser? 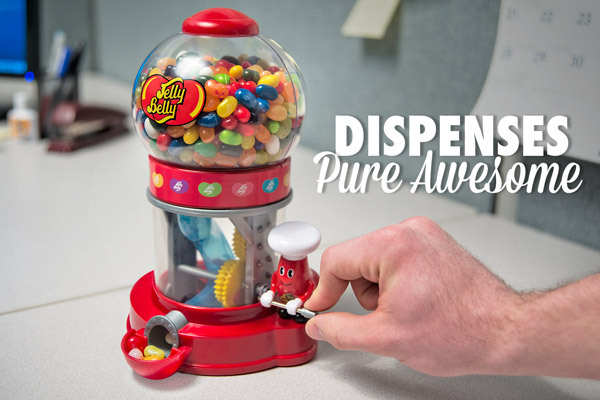 Answer: While this dispenser is specifically designed for Jelly Belly beans, we can't think of any reason why a candy with similar dimensions couldn't be used. That being said, we can't officially endorse the use of other candies with this dispenser. Question: So... will Jelly Belly police come to my house if I were to use another type of candy in my dispenser? Answer: Let me put it this way. 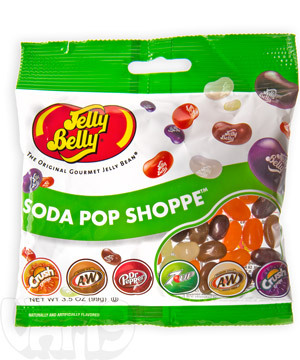 If I had a device on my desk filled with 570 delicious Jelly Belly beans, the last thing I'd be thinking about is other candies I could put into it. Instead, I'd think about all of the devious things I could make other people do in exchange for one of my magical candy beans. C'mon, they're Jelly Belly jelly beans! Question: Just shut up and take my money.